CHOCOLAY TOWNSHIP, MI – Evelyn Martha Alanen, age 81, of Harvey, entered eternal life on Saturday, September 8, 2018, at her home, in the loving, comforting care of her family and the caregivers of UP Home Health and Hospice. Born July 5, 1937, in Paynesville, a daughter of Raymond Wilmer and Elli Maria (Holmes) Jacobson, Evelyn was raised in Bruce Crossing and graduated from Ewen High School. She had been a Marquette area resident since 1955 when she enrolled at St. Luke’s School of Nursing. For over 32 years, Evelyn was employed at Marquette General Hospital as a registered nurse. On September 7, 1957, Evelyn married Elmer Alanen. In their leisure, Evelyn and husband, Elmer, enjoyed spending winters in Florida and other travels. Evelyn enjoyed collecting ruby glass and spending time at the family camp at Cooks Lake. 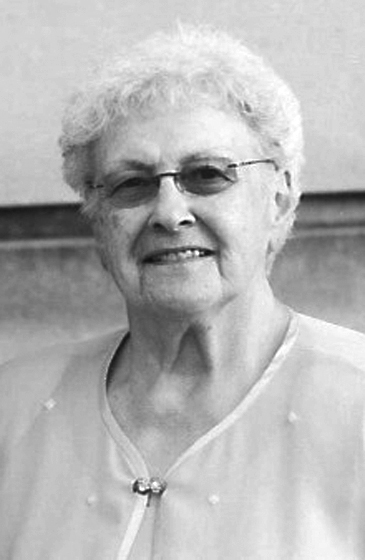 Evelyn was a member of the Eastwood Apostolic Lutheran Church in Negaunee. Survivors include her children, Pamela Ann Alanen of Austin, TX, Brian Scott (Tammie) Alanen of Harvey, Jeffrey Lee (Jil Jenkins) Alanen of Halfway Location, and Janice Marie (Ken) Barnett of Gwinn; her grandchildren, Sabrina (Charles) Henson, Nicholas (Lindsey) Alanen, Dustin Barnett, Devin (Kelly Ray) Barnett, Tyler Larson, Ann Marie (Chris Prahm) Alanen, and Emily Barnett; great-grandchildren, Oliver and Emery Prahm; a sister, Mae Lucille (Scott) Ohman of Marquette; many nieces and nephews; and her beloved canine pal, Suzie Q. In addition to her parents, Evelyn was preceded in death by her husband, Elmer Alanen; a sister and brother-in- law, Lillian and Raymond Mattson. The family will receive relatives and friends at the Eastwood Apostolic Lutheran Church in Negaunee on Wednesday, September 19, beginning at 12:00 noon until the time of service at 2:00 pm. Pastor Dale Niskanen will officiate. A reception will follow in the church fellowship hall. Interment will be made in the Hillside Cemetery, Bruce Crossing.